If you look back over the last 20 years or so, we’ve had these movements, and it’s fascinating just how long they can take to really have an impact on how software is designed, built and developed. The vision sometimes doesn’t seem to really come to fruition. I’m speaking specifically right now of the service-oriented architecture, but still the impact is there, and it just takes awhile. It’s almost like a gestation period before some of the more interesting things will spark out because I remember writing about service-oriented architecture and open-source technology back in 2005 and thinking to myself that’s some pretty clear handwriting on the wall. It seems to me the legacy way of building these monolithic applications is going to be challenged quite ably with this new paradigm, with this new way of looking at software development, with this new way of looking at managing data and analyzing data. Then I think the SOA movement got baked into how the legacy vendors built stuff, but what you guys at Exaptive have done that strikes me as just completely amazing is, in my opinion, you really seem to have fully embraced the spirit of SOA and this interconnectivity and this reusability, not just of applications but of bits of applications and code modules and so forth. With all that prefaced, I’ll throw it over to you to give us a thumbnail sketch of where Exaptive came from and where you are going. Dave: I think that’s an interesting point. You mentioned the term “monolithic,” and talking about SOA really is an attempt to try and break down into more granular pieces what was becoming increasingly cumbersome monolithic software development. That’s definitely one of the goals with Exaptive: to embrace that idea of a more agile, of a more modular way of building software instead of creating these really monolithic applications. It’s important, I think, for a number of reasons. One is that the act of building software has always been taking small pieces and connecting them together into bigger and bigger systems. There’s a lot of interesting design work that happens as an architect or a developer assembles together libraries and algorithms and routines and frameworks into these larger programs, but traditionally as they assemble it together that development has really been an act of obfuscation, like all of the decisions that go into how that big, monolithic thing is made is obfuscated in the end product of the monolithic thing. That’s really a shame because that’s where there are really big innovations, not just that someone used a particular algorithm to look at a particular data set, but why did they do that and how else could that be used? Service-oriented architecture, as you said, was an interesting attempt to break that down, and I think its had some successes as we see that more and more organizations are creating APIs, for example. More and more organizations are creating open data sets and services that allow you to access those open data sets, but what we haven’t really seen yet is a framework that truly makes it easy to connect all of those different services together in a way that is loosely coupled enough to disconnect and reconnect in new ways. That’s really the ethos behind Exaptive. I’ll make an analogy to big encyclopedia companies. Encyclopedia Britannica created a fantastic encyclopedia, and they did so in a traditional way. They had a big company with lots of editors, and they put a lot of work into making a really beautiful, monolithic thing. When Wikipedia came out, a lot of people scoffed at it. They said there’s no way that Wikipedia is going to end up being nearly as good as Encyclopedia Britannicafor a lot of different reasons. One, it didn’t have much content, and it looked like it wasn’t going to catch up. Two, people were worried about how it would be accurate. There were these concerns. Now we live in a world where we can’t imagine life without Wikipedia, and we can’t imagine Britannica ever catching up. I think there really is an accurate analogy here because what Wikipedia did is it created … You can think of it as a service-oriented architecture. They took this monolithic thing. They broke it down into very modular components which were the articles. They created a systems where lots of different people could contribute to those things, but what the wiki was was it was a framework that allowed the articles to come together in a cohesive way, allowed them to get revised and commented on, discussed, and allowed them to evolve. Now you have an encyclopedia that can grow and can change and can keep up with all of the things that happen in the world in a way that the more monolithic encyclopedia really never can. That’s what we’re trying to do with Exaptive. We’re trying to create a framework for software that moves away from the monolithic Encyclopedia Britannica view of software, and it moves toward a very powerful and extensible Wikipedia model of software. Eric: That’s an excellent analogy, and you really got me thinking as you were talking about the walls and the constraints that I mentioned at the top of the call because when you embrace the cloud as a delivery mechanism, a marshaling area, as a platform, as a way to interact with other people and other organizations, that really fundamentally changes the game. Of course, that’s what Wikipedia did is develop a cloud-based solution. It’s a web-based solution so anyone with access to the Web can get in there and start playing around. It seems to me that when you think of it that way, you realize that the walls which surround traditional enterprise software are all fabricated, meaning there’s no real need to have them besides a corporate desire to withhold the gold until they get their money for it, right? I mean, that’s why you have closed-source software in the first place. Really open source is what threw the gauntlet down to closed source, but even that’s 30 years old now. There’s nothing new about open-source software. I think what’s happening is that we’re seeing this nexus of ideas and visions and reality all come together to create the possibility for something like what Exaptive is doing, not just succeeding in some small sense but really fundamentally changing how people look at software development and opening up some of the gems that otherwise would have been hidden, right? Dave: Yes, it’s interesting that you’re bringing up this comparison between closed source and open source. I think that’s interesting for a couple reasons. One, I think the rise of open source really shows that something needed to change. The fact that it became so popular, it is so popular, and it’s produced so many great works really, I think, shows that there was something flawed with more traditional closed-source methods. At the same time, the other thing that I think is interesting is that it’s a very dichotomized position. We have this spectrum of development, and we have these two complete opposite ends of that spectrum, these two poles: closed source and open source. One of the things that I find very interesting to think about is exploring where there are avenues in the middle. What is there that can exist between closed and open because there are really good reasons for closed source, too. People do need to be able to make money, and while there’s ways to monetize open source, it’s not as easy as monetizing closed source. I see a lot of people and I’ve worked with lots of people that work on open-source projects in their spare time. It’s their passion, but they also work for companies that pay their bills. One of the questions I asked myself is: we produce such fantastic things through open source, what more could we produce if those people could quit their day jobs and do the sorts of things that they want to do full time? This really gets to what I think is a societal change going on which has to do with specialization. I think 20 years ago, if you were a software company, you made software, and that meant that you did back-end work, you did middle-tier work, and you created a front end so people could use it. That’s what a program was. Now that’s really changed. We have companies that are just producing algorithms. If you look at Alchemy that recently got bought by Watson, they’re a natural language processing provider, and all they do is they have an algorithm that analyzes language. They don’t have the data set that goes into it, and they don’t have the front end to do anything with the results. It’s just a very narrow slice. We’re seeing a whole rise of developers that focus specifically on front-end visualizations or WebGL 3D visualizations. They don’t have the algorithms that feed it. They don’t have the data. Then we have all these data providers that are just focusing on the data piece, so we have this environment where software is getting increasingly specialized, which is a good thing, but it brings with it its own problems. The good thing is it allows people to get very good at what they do, but it creates silos, and the solution to many of the data-centric problems that people are facing today will not come from one single technology. Hadoop will not solve the problem that somebody has because Hadoop needs a front end to be able to interact with it. Hadoop needs back-end data to MapReduce. I think one of the things we see in the marketplace right now is this increasing specialization. You have this proliferation of different technologies and data sets and algorithms and visualizations, and you have an increasing recognition that there’s a value in harnessing that data, but in order to harness the data you need to connect together lots of different components. Some of those components are open source. Some of those components are closed source. What I’m interested in is the idea of how you have collaborative development. It’s not necessarily open development. It’s not necessarily closed development, but it’s really collaborative development where you can take pieces from other experts, assemble them together into something that solves your specific problem, but make that solution something that other people can build on or change or evolve to solve their own specific use cases. Eric: That’s a really good set of points that you just made, and I’ll throw out a couple of things to dig in a bit deeper. One, this analogy popped into my head, which I’ve thought of before, and it just makes you think a bit about what’s happening. I think you hit the nail on the head that we are in the middle of a societal change, and it is not a small one. I think you’re exactly right that specialization is going to be the future. I mean, you think about how our grandparents, or certainly my grandparents, you would go and get a job with a big company, like my one grandfather worked for Texaco. He worked for Texaco for 40 years. Well, you’re not going to see that too often anymore. You’ll still see it. It’s going to happen, but it’s pretty rare. It’s more the case that people work somewhere 2 to 3 to 5 years, then go somewhere else or in the software world you can get acquired. I just thought to myself way back in history, if you think about the history of warfare, castles were such an incredible defense mechanism all the way up until the cannon was invented, at which point they became not so successful at keeping the invaders out. Dave: Yes, I think there’s something interesting about this idea of mobility that you’re talking about in jobs. I’d say it’s not just the mobility that the knowledge workers, which is an interesting new form of job nowadays, and I think it’s not just that the knowledge worker is not necessarily staying at a company for 20, 30, 40 years. They’re moving around. I think more fundamentally that the thing that’s happening is that the knowledge worker is solving problems in areas for which they are not the subject matter experts. It’s worth thinking about that for a second. If you think about all of the innovations that are coming out around machine learning, and deep learning has been very popular. Those techniques are being used to do facial recognition which helps, for example, either in Homeland Security or it helps in consumer applications, photograph sorting, or image analysis which then gets used in oncology, radiology. You can use machine learning to look at tumors and figure out things that are hard for radiologists to figure out. What’s interesting about that is that the people that are designing those machine-learning algorithms, those image-analysis algorithms, are not oncologists. That really, I think, pinpoints both the power of specialization, the fact that somebody can specialize in machine learning and they can solve problems in Homeland Security without knowing anything about that domain and problems in oncology without knowing anything about that domain. It shows the power of specialization, but it shows the necessity for being able to connect different things together. That, I think, is one of the really fundamental points that people are creating these specialized pieces of information, but without a framework to get those techniques connected to the use cases that need them, you end up with things just staying in the silos in which they were created. Eric: That’s another good point as well. You got me thinking here about a couple other things. Where your name came from, Exaptive? I looked up the definition of exaptation … There are a couple of different definitions for it, actually. One of them is a feature having a function to which it was not originally adapted or selected. Number four, I think, is probably the most aligned with your vision, which is predisposition toward adaptation. You reminded me of something that I learned many years ago in enterprise software that I don’t think that a lot of people realize, but once you’ve been in the business for a while and you pay attention and you listen, you recognize how true it is. I remember learning it from the guy who ran a software company back in the early 2000s. He said that when you talk to your customers, you’re always amazed at the interesting ways that they wind up using your software, ways that you never envisioned. In a sense, yes, it’s good if you wrote the software, you know what you were trying to build. There’s a huge argument around the value of the design point in understanding what you’re trying to build and then building it accordingly, because the design point is fundamental to what you can achieve in software. Then there’s this whole other side of the equation which is that people who take a look at your software are going to come up with really interesting ways to use it that you never thought of. I think that’s just fascinating. Dave: Yes, and they’re going to get really frustrated if they come up with those ideas and they can’t make your software do that because there’s nothing more exciting than having that ah-ha moment when you realize you can use something in a particular way that solves your problem, and there’s nothing more frustrating than having that ah-ha moment denied to you for some silly configuration reason or formatting reason in the software. This is a topic that’s really near and dear to my heart because when I did my undergrad at MIT and I paid my way through college, and one of the jobs I had, of many, but it was grading C-problem sets. Every week I would see a hundred solutions to the same problem. The students at MIT were pretty conscientious. Most of them would work hard and get their C programs to work, so almost every solution I looked at worked, but it was really interesting to see the huge range of possible solutions in the ones that were elegant, the ones that were flexible versus the ones that were rigid. I really came to appreciate software not from the perspective of what a given program can do but more from the perspective of how a particular program can change. That sort of fits in with the name of our company, which is based on this, as you alluded to, this biological term which is from evolution. Stephen Jay Gould coined the term in the early 1980s. He wrote a paper called “Exaptation, The Need for a New Word in Science,” and he said, “When everyone looks at evolution they get excited about adaptation, which is something evolving to be better and better at a particular advantage.” He said, “But if you look enough cases of evolution, you see that there’s this other thing that happens. It’s where something starts out evolving because of one set of survival advantages, and it gets serendipitously co-opted for something completely different, but ends up thriving there. In 1982 he said, “We don’t have a word for this. We need one.” He decided to call it exaptation. A great example is bird feathers. Bird feathers evolved originally because they kept animals warm. They trapped a lot of air. Air is a good insulator, but if you’re an animal and you trap a bunch of air, and a predator chases you off a cliff, instead of plummeting down and dying, you might flutter down and live. That means you get to reproduce, and many generations later, in a simple slide version of evolution, you get to fly off that cliff. Flight is the exaptation of warmth. I was fascinated by this. I think, because what I’m fundamentally interested in, both personally and professionally, is the mission of our company: How do we create tools that facilitate innovation. How do we help people have good ideas? I watched as people have created software that helps people do all sorts of things. It helps people catch cabs, it helps people find music that they didn’t know they liked. It helps people get dates and find potential spouses that they might not otherwise get to meet, but we haven’t really created a system that helps people find new ideas. We still have this sort of mythology that ideas can’t be facilitated, that they’re just the domain of eccentric geniuses that have a flash of insight in their bathtub, and you’re not going to automate that process. I think it’s a shame. I think we sell ourselves short by not trying to tackle that problem because I think, and this comes back to the name Exaptation. 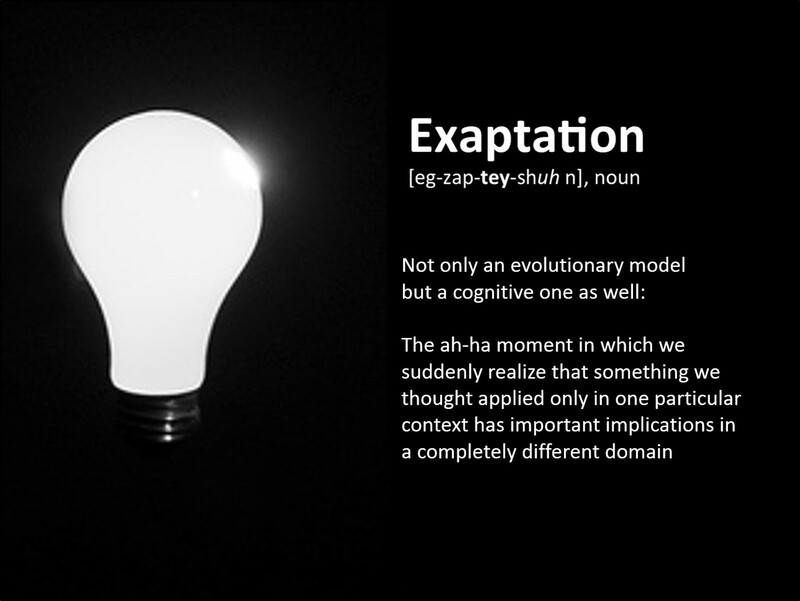 I think that one of the ways that innovation happens is through a cognitive equivalence of biological exaptation. Biological exaptation, something starts out for one purpose, it gets co-opted somewhere else. I think mental exaptation is when you find that you’re thinking about a particular problem or a particular resource that you have, like a particular algorithm, and you say, “This is good for one particular thing,” and the mental exaptation is that ah-ha moment where you realize it can be applied in a completely different area. Almost always, when those ah-ha moments happen, they are the ah-ha moments that lead to very significant technological innovation and frequently very significant societal innovation. GPS was not created in order to help people find restaurants on Yelp that are close. GPS was created to be able to drop bombs in a very precise location, and now we use GPS for tracking how far we run, for navigating on the highway, and all these other things. That’s an exaptation. The mission behind my company and what we all feel so strongly about that we named the company after it, is we want to create a system where someone can create a particular piece of technology, a data science algorithm, or a visualization or a data set, because they think they know what they want to do with it. Back to your earlier point, they think they know what they want to do. They can build that very quickly, but then someone else can exapt some portion of those ideas for a completely different set of purposes. When you talked about service-oriented architecture, you said it’s not a new idea, but it’s an important one. I think the reality is that most “new ideas” are not really new. They’re just different configurations of existing ideas. If there’s anything that software should be really good at nowadays, it should be good at helping people to recombine things in new ways. We did it with music. There’s another interesting analogy, which is that if you think about music, music used to be fairly monolithic. We did not always have the technology to digitally sample music and cut it up into different tracks or into different samples. As soon as the technology evolved to the point that we could take a monolithic song and decompose it into more granular samples, I think something very interesting happened, which is it created a whole new class of music because people started resampling things. I think this point really can’t be understated which it’s not that it just created more music in the world. It didn’t more of the same. It created a new genre of music. When I think about, just bringing this back to the software domain, I think there’s a lot … I’m a developer myself, and before I founded Exaptive I ran a team of software developers at my previous company. One of the things we always struggled with was just the productivity and the time it took to build applications. The reason that’s important is because when something takes a lot of time, you don’t experiment in the way that you would if it was easier, right? Eric: That’s a great point. Dave: There are three aspects to Exaptive, but the first aspect is it’s fundamentally a productivity tool. It’s a rapid application development environment that lets you build applications by just connecting together different components that either somebody else built or you built. I think productivity tools get a little bit of a bad rap because it’s easy for a manager to say, “Well, if this is going to let us build an application in one day instead of one month,” they might look at that as just a cost equation. How much would it cost to do it in one month, and maybe it’s just worth eating the cost of one month of development instead of eating the cost of the tool at plus-one-day of development. I think that’s an oversimplification because when you can build things that quickly, you build more things, and you build different things, and you create the environment of combinatorial play, and that’s the environment where new ideas come from. Eric: Frankly, I had not even thought of that point, and I’ve thought about this topic quite a bit, but you’re right because it’s not just that you’re saving time. What you’re really alluding to is opportunity cost, right? Eric: The whole concept of opportunity cost, and you don’t know what you would have come up with had you had some more time. More importantly, I think it’s not just time. Time is a great metric, of course. There are only 24 hours in a day. That’s a reality that’s not going to be disrupted anytime soon by my estimation, but energy is very important, too. Then this whole concept of morale and of being inspired to do things. When you’re inspired, when you have a real fire in your belly so to speak, you will do even more things. It’s this interesting dynamic where you amplify the energy and the time that you had and get even more done than you thought was possible, right? Dave: Yes, and I think a big part of that amplification that you’re talking about is the nature of an agile, iterative process. You talked about monolithic software versus service-oriented architecture. There’s another allusion we can make, waterfall software development versus agile software development, right? If you can create processes that are more iterative and are more agile, it’s not just about saving time. It is about that energy you’re talking about. It’s about the recognition that when you allow people to iterate and get quick feedback and learn from that feedback, they will change their minds. They will change their opinions about what’s important. If you overly constrain the process in the beginning, which is what waterfall development used to do, then you don’t get as good product at the end because you don’t have the sort of living environment to be able to adjust and change. I think this happens a lot when software development obstacles get high, which is if you need to devote six months to building something and it’s going to cost a lot of money, then it forces you to pick a very narrow path and not to change it too much. If you have rapid application tools that let you prototype 50 different things in that same period of time, then you can learn from that. You can get excited about that. You can generate new ideas that you didn’t necessarily have before, and then ultimately the end product is maybe different but often better than what you had in mind when you started. Eric: It’s fascinating stuff that we’re talking about here. What you guys have done, of course, is create a couple different things, one of which is this Xap Store. I think we should all give credit to Apple and Steve Jobs for the Apple concept of the app store because that was a pretty new thing. You could argue there were similar entities in the past but nothing like that. Nothing like creating a marshaling area and opening the door to let people create apps and submit apps, etc. That’s basically what you’ve done for enterprise technologies. You created the Xap Store which allows the sharing, selling, collaboration around not just applications but parts of applications, right? 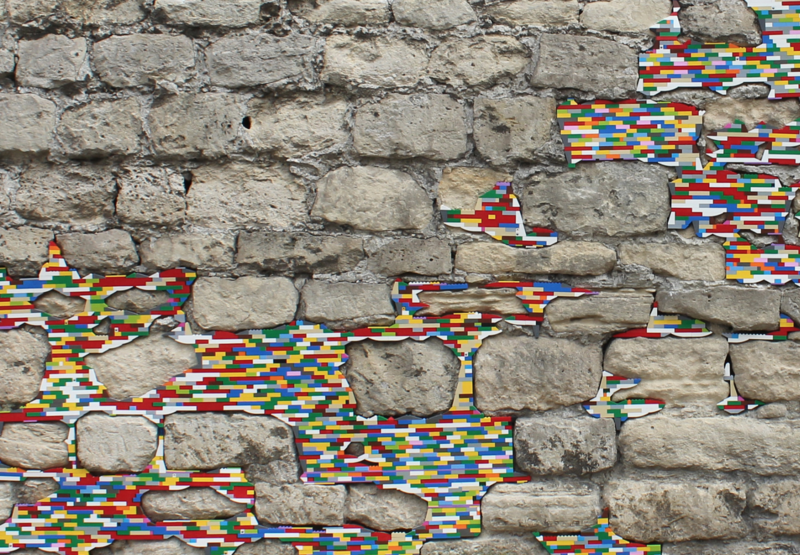 Code modules, little bits and pieces like Legos that you can piece together to create something new, right? Dave: Yes, that’s exactly the key there. I think that Apple’s app store was something that I watched with a lot of interest, the rise of that, not just from a technological perspective in terms of creating a marketplace where people could get things. I thought it was also interesting from a societal perspective to watch the rise of these mini entrepreneurs that got created because they had this environment in which they could sell their products. I think of them as micro-preneurs. It’s hard to be an entrepreneur. You have to do all this stuff to create a business, and there’s a lot of legal paperwork involved, and sales and distribution is hard, but what Apple did is they eliminated a lot of obstacles to entrepreneurship. Suddenly the app store gave rise to two people in their dorm room building video games or one person coming up with a productivity tool. That was really interesting to me because I think it shows that one of the most underutilized resources I think we have in our society today is people’s creativity. When you think about starting a company, I think there’s two ways you can look at it. You can take a traditional entrepreneurial approach, and you can say, “What problem are you trying to solve?” and try and solve someone’s specific problem. I think you can also look and say, “What underutilized resource can be better utilized?” What the app store really showed is that, and it’s not just the app store — you look at the rise of YouTube and Twitter and blogging. What all of these things show is that there is a huge untapped potential of people’s creative, generative energy. What we’ve thought a lot about at Exaptive is how do we create an offering that, one, does solve a specific problem, lets people build data applications much faster and easier than before, but simultaneously leverages this untapped or not completely tapped potential of people’s generative energy. The key difference there in what we’ve created with the Xap Store relative to Apple’s app store is what you were alluding to in terms of it’s not just for selling finished applications; it’s also for selling pieces of an application. One thing I think of as a computer programmer myself is I always want something I build to go out in the world and to take on a life of its own, but as you said, I don’t always know what the best use case is for it. My goal in creating the Xap Store is for all the nerds and the specialists and the programmers that have some really great skill set where they know how to extract a particular type of data or they got a Ph.D. on a particular algorithm or they’re really good at coding a particular type of visualization, I want them to be able to focus on what they’re good at even if they don’t 100% know what it’s good for. To me, that’s a very exciting view of society. What if we could all just do what we’re best at, and we could put those pieces that are our best effort into an environment where they can be combined and recombined, and they can evolve into useful things. That’s the goal of the Xap Store. Eric: I think that’s a really excellent vision that you have. I think you’re spot on. I think you’re also correct about this whole under-leveraging, if you will, of human creativity. You figure the mind, in and of itself, is a combinatorial marketplace. It’s a marketplace of ideas, and we have such incredibly powerful creative juices, I suppose. You have to think about just how multidimensional the human mind is. In fact, I would argue we’re not even close to cracking the code to understand just how amazing and multifaceted it is. Even in language, if you look at the English language, for example, it’s one of these languages where any word can modify any other word, so it’s a very dynamic and flexible environment. Being an old philosophy major and English major, I’ve always been a big fan of poetry, and how interesting is that the way poetry can bend and shape words, the meanings of which you thought you understood, but in reality maybe you didn’t completely. All these things play into this concept of a combinatorial marketplace which, I have to say, I think is just quite brilliant, so good for you guys. Dave: Thanks. I like the idea of the brain as a combinatorial marketplace. I’d also say our cities are combinatorial marketplaces. When you look at the sort of innovations that come out of cities like San Francisco and New York and Boston, and internationally, a lot of that is because you have this combinatorial marketplace where the cities have hit a critical mass. That critical mass has made them very different from towns or from villages. That’s one of the interesting things about critical mass, right? For most things in the world, more is just more. YouTube with 100,000 videos is not that different than YouTube with 100 million videos. It’s sort of inherently the same thing, but if you think of social structures, a village with 100 people is not the same as a town with 10,000 people is not the same as a city with a million people. You get these state changes that happen. It’s like with music that I was talking about. It’s not just that you get more music. You get a different kind of music. When you put lots of people together in tight quarters, the same thing happens. You don’t just get bigger villages or bigger towns. You get a city, and a city is different because of that combinatorial marketplace aspect. You get specialization, you get immigration, and you get all kinds of friction. You have to wait in line at Starbucks. You have to wait in line to get out of the grocery store, but the funny thing is that it’s often in those bits of friction that you run into people you see you have something in common with a person who’s standing in front of you because they’re holding a book that you read before, and you end up in these conversations that often can spark ideas. You end up running into people that turn into collaborators. We talked about Exaptive as a rapid application development environment and Exaptive as a combinatorial marketplace, but I think there’s one other piece, which is it’s not enough to just have lots of different stuff in a place if you don’t try and facilitate the serendipity of the right people finding the right stuff that’s going to generate an idea for them. That’s the piece I’m the most excited about in terms of where we’re going with the company is that when you create tools that people use, when you create a development environment that people use to build applications, and when you create a marketplace that people use to pull out components for those applications, you’re actually doing two things simultaneously. You’re helping people with a problem they have today, but you’re collecting metadata that can become useful tomorrow. That’s the piece that I think is the most exciting which is that the metadata about how people build things, about what sorts of components they connect together, about what sorts of components in the marketplace they choose to download or not, within privacy constraints. Some people want to share this information; some people don’t. We honor that, but the potential of that metadata, I think, is the really big idea behind achieving the goal to facilitate innovation which is that you can then create what we like to call a cognitive network. It’s like a social network, but it’s not based on who knows who or who likes who. It’s based on what people have in common based on the types of problems they’re solving. By mining the metadata to create that cognitive network, you can actually facilitate a certain degree of serendipity that in our real world environment we tend to just leave to chance. Eric: I think that’s exactly right. I’ve always been fascinated not just by things like inspiration and ideas, but also by this concept of constraints because constraints will, to your point, force someone to think in a new way. Also, this issue you brought up about culture; cultures are different. I’ve lived in several different cities around the United States and have done a fair amount of traveling, and culture changes from town to town and city to city, so how you view some entity will be remarkably different from one place to another, and that’s all good because it’s all perspective, right? That’s the value of philosophy as a learning science, because it encourages you to think in different ways. That’s when you come up with new ideas or you find ways to apply ideas to different business problems or challenges in life, right? Dave: Absolutely, all that diversity and perspective is absolutely key to new ideas. As someone who’s founded a company that is trying to facilitate new ideas, we have to spend a lot of time thinking about how new ideas get generated, and we come back to this thing you just alluded to with some frequency, which is that what generates new ideas is an environment in which lots of different perspectives can play off of each other. I think that we actually have another societal challenge ahead of us when it comes to idea generation, which is I think that particularly in America we love the mythology of the lone genius. If you think about the geniuses and the inventors that we put up on a pedestal, we almost always picture them as these solitary figures. If I mention Thomas Edison, if I mention Einstein, Steve Jobs, you can picture those people in your mind. All three of those people, I bet when you picture Jobs and Edison and Einstein, you picture them as a single portrait alone. They’re standing alone. That’s how we’ve represented them in society, and in reality we know it’s not like that at all. Edison had a huge lab that helped him invent things. Einstein worked in the Patent Office where he was literally in the combinatorial marketplace of ideas, and Jobs’ innovation was really synthesizing lots of different materials and technologies that existed previously, but we think of these people as solitary figures. We don’t think as much as I think we should of ideas as networks. I think there’s a really interesting time that’s coming now where all of the interest in data has created a buzz about network and the recognition that many things in this world are networks and can be represented as networks. We have increasingly good algorithms and modeling tools for looking at the propagation of things through networks, whether it’s a signal through a cell phone network or whether it’s a drug that gets expressed through some biological network. We have all of this sort of nuance that we’re developing for both modeling and thinking about networks, but we haven’t yet applied that, I don’t think, to innovation and ideas as networks. That’s the approach that we’re taking with Exaptive is we’re saying all ideas are networks, and we need to create the ecosystem that allows the individual pieces of different ideas to network together. That’s really different than the focus that networks have been in technology to date, which has been primarily social networks, and I think we don’t need a lot more social networks in the world, but I think we desperately need more cognitive networks in the world. Eric: Wow, that’s great stuff. Well, folks, we’ve just burned through about an hour. You can see why I’m so excited about this stuff. I think it’s really a fantastic idea. I think it’s not just an idea that’s static. I think what Exaptive has tuned into is the beginning of a whole new phase in how human beings invent, innovate, collaborate, develop software, solve problems. I think this is just fantastic stuff, so David King and Exaptive, the whole team there, thank you so much for your time and congratulations. Dave: Thank you. Thanks for having me. Eric: You bet. Okay, folks, we’ve been talking to Exaptive. You’ve been listening to Inside Analysis. Talk to you next time, folks. Bye-bye. The interview was first posted on Inside Analysis.